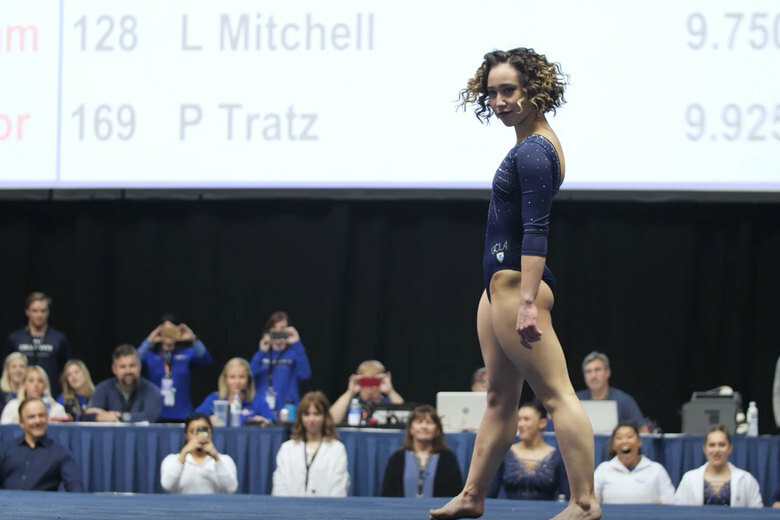 With a smile and a shimmy of her hips, UCLA gymnast Katelyn Ohashi kicked off an electric performance at the 2019 Collegiate Challenge at Anaheim Convention Center Arena on Saturday. To a medley of up-tempo vintage hits, from Ike and Tina’s “Proud Mary” to Michael Jackson’s “The Way You Make Me Feel,” Ohashi tumbled and flipped her way to a coveted perfect score. Since January 12, when the UCLA Gymnastics account tweeted a two-minute video of Ohashi’s flawless routine, the footage has accumulated more than 26 million views. But besides going viral, Ohashi’s routine helped UCLA beat Cal, UC Davis, and Michigan State at the meet. Saturday marked the fourth time in the 21-year-old’s career she’s received a perfect 10. And it’s not the first time she’s had a little fun to Jackson either–in March she moonwalked to the King of Pop at the PAC-12 Championship and accumulated millions of views for that performance (you can watch it here). “I think what I show is joy when I do stuff, so I think always having a love for what you do every single day is something that I hold extremely close to my heart because I know what it’s like to not feel that,” Ohashi told NBC Nightly News.